Back in 2007 when the vision of The Bridge was first birthed, we could not imagine the plans God had in mind for Paris. 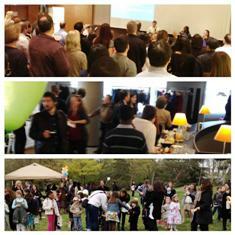 The Bridge celebrated its two year anniversary in March, and on Easter welcomed the largest crowd yet of 172 people! We are preparing next Sunday to launch our 7th round of small groups, and each week on Sunday mornings there are around 120 people from 40 different nations. This Sunday is the final vote in the French presidential election. Please pray for the French people as they wrestle with the common issues of taxation, immigration, education, but also with the vital approach to how God is seen the country and what place is allowed for the church. For instance, recently France passed a law preventing prayer in public places. We know that God works in people’s lives regardless of government “permission,” but we pray that God’s name will be proclaimed in France in every way. As you know the vision of The Bridge has always been much more than a single church plant. We want to reach every language and culture group in the Paris region, representing the entire world. After two years of preparation, our first new expression launched last month. A French speaking service representing many African nations and islands around the world has begun. It is a passionate and vibrant meeting. We know that this is just the beginning! This July we will return to the U.S. for a year to reconnect with many of you. We have so many stories to share when we return. Please let us know if you would like us to share at your church. We will also be sharing more stories through this newsletter and our website! We are thankful for the wonderful team God has built here in Paris that allows us to be gone, and for the ministry to still continue to grow! As our two-year Missionary Associates began leaving, God has been faithful to replace them with wonderful people leading ministries here in Paris. Previous postWhat's new in the New Year?